Canadian Hall of Fame trainer Robert Tiller won the 2017 Frost King with Silent Name son Be Vewy Vewy Quiet and has a pair of contenders by that sire in this year’s seven-furlong edition, set for Wednesday evening at Woodbine. 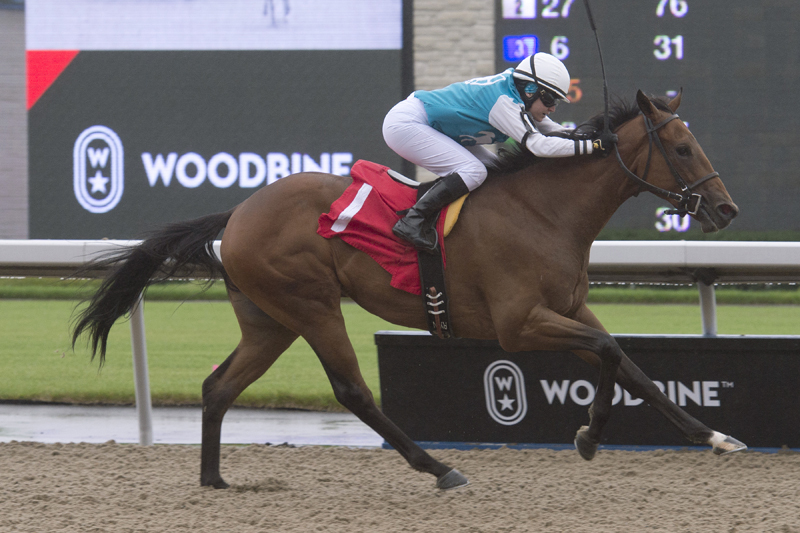 Owned by 3 Sons Racing Stable, Captain Handsome is the 3-1 morning line favourite in the $100,000 Ontario Sire Stakes with jockey Sheena Ryan listed to ride while Stronach Stables’ Silencium has been assessed as the 4-1 third choice and will have Eurico Rosa Da Silva aboard. Both Tiller-trained youngsters posted 3-1/2 length winning margins at first asking. Captain Handsome is out of the Phone Trick mare She Ain’t Much and is a half-brother to the connections’ stakes winner Circle of Friends. He won his career debut impressively over five furlongs on October 7. Silencium heads into the Frost King after winning his first six-furlong start in front end fashion mid-September. The Tiller trainees will face a pair of stakes winners including Bourbon Stritta, the 3-1 second choice on the morning line. Undefeated in two career starts, Bourbon Stritta got up in time to win the Bull Page Stakes last time out on September 23 for trainer Robert Neumann. Kazushi Kimura picks up the mount aboard the Old Forester gelding previously handled by Da Silva. Blessed Two went from last-to-first for a narrow score in the OLG Simcoe Stakes on August 29 between a pair of top-three finishes. The Souper Speedy colt, who will be ridden by Gary Boulanger, is conditioned by Kevin Attard for owner Derek Chin. Seguimi, a half-brother to multiple graded stakes winner Flameaway, finished a game third in the Simcoe then broke his maiden going 1 mile and 70 yards on September 26. Stuart Simon trains the Victor’s Cry-Vulcan colt for owners Anne and William Scott. Just over a week removed from his successful career debut, Krachenwagen will run back in the Frost King with Jeffery Alderson aboard for trainer Buntain Angus and Greenoaks Farm. The Ian Black-trained supplemental entry Dun Drum enters the King Frost off a mid-October maiden-breaking victory in rein to Emma-Jayne Wilson while four-time starter Sandretti will look to bounce back after being interfered with in the Bull Page, with Alan Garcia taking the reins for trainer Harold Ladouceur. Hungary, from the John Mattine stable, and the William Tharrenos-trained My Silencer will launch their careers in the mid-week stakes feature. The Frost King is scheduled as the sixth of eight races on Wednesday evening. First race post time is set for 6:45 p.m.